Customer Service: 0871 911 7000. 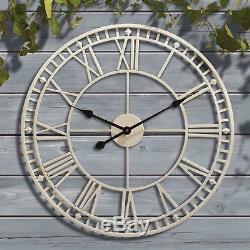 Giant Garden Wall Clock Roman Numeral Metal Outdoor Large Round Face 60cm NEW. Durable; Made from durable and weatherproof powder-coated steel. Stylish; Attractive diamond-patterned edge and a Roman numeral face. Colour options; Available in black, grey or cream, with black time hands. Roman Numeral Garden Wall Clock. Watch time pass with this elegant garden wall clock. It features an attractive diamond-patterned edge and a Roman numeral face with contrasting black time hands. Simply mount to your preferred wall or fence using the sturdy built in mount (screws not supplied), and watch time pass while you are enjoying long lazy days in the garden. Constructed from powder-coated steel for durability, this clock is available in black, grey or cream and makes a handy addition to any garden or conservatory. Requires 1 x AA battery (not included). Dimensions: Diameter 60.3 x H4cm. Suitable for indoor and outdoor use. Here at Clifford James we have all you need to make your house a home. From home furnishings, bedding and laundry to security and DIY. Looking for garden gadgets and equipment? Our garden range includes power tools, planters and storage solutions. Many of our products are innovative solutions to everyday problems that often you can just not find anywhere else, whilst others are just great offers on must have items for you and your family. All deliveries require a signature. Please allow longer for Ireland, Scottish highlands & Islands and International destinations. &###xC2;&###xA9; 2013 Clifford James, part of BVG-Airflo Group Ltd. This listing is currently undergoing maintenance, we apologise for any inconvenience caused. The item "Giant Garden Wall Clock Roman Numeral Metal Outdoor Large Round Face 60cm NEW" is in sale since Tuesday, April 24, 2018. This item is in the category "Home, Furniture & DIY\Clocks\Wall Clocks".